Google Allo – is it better in anyway? Google has come up with a smart message app that is called Allo, and it is considered to be competing with WhatsApp, Messenger from Facebook along with various other messaging apps. The major difference between Allo and other messaging apps it its various “smart” features – It can make a reply to messages meant for you and with its in-app assistant named as “@google” can search the web, play different videos or provide various other suggestions. This app is now available for both Android and iOS users, which is also based on Google’s own machine learning application to get the zest of the way users talk and generate necessary suggestions over time. Allo’s suggestion are based on what it finds in your messages. Along with providing responses, AI or artificial intelligence also comes with a virtual assistant who can give you directions, topic related information like news, travel information, and even in-message games too. Google also unveiled a new video calling app which is aptly named as Duo which is another smart attempt to outstrip the various popular communication mediums. In case any user wants to use Allo, he/she won’t require a Google account. The users can sign up with their own phone number which makes it similar to WhatsApp and Apple’s iMessage rather than like Hangouts and Facebook Messenger. After you download this app, you will have to provide it permission to get access to your contact list so that you can create a group and even start individual conversations. Allo comes with three separate styles of chat options. First is the normal messaging, second is where you can converse directly with a virtual assistant. Third is “incognito chats” which is an encrypted and comes with disappearing messages. When you chat on incognito mode, the notifications won’t tell what the message contains and who has sent it. Once you have downloaded the Allo app, you will need to give it permission to access your contacts so you can start a group or individual conversations. Like every other messaging apps which are quite popular, you can also send images and videos along with custom-designed stickers which come with it. To call the virtual assistant, you have to start your message with “@google” and then enter your clear commands. Rest, you don’t have to make any changes to activate the suggested responses. The virtual assistant can get the information from the web along with including YouTube videos in the chat and provides minute information. It also offers various other features like suggesting nearby restaurants, flight related information, and many more things. The user can also ask the virtual assistant various private questions which are duly answered by the assistant. For example, you can ask for recent news headlines or even weather related information. Allo comes integrated with Google’s other services like YouTube, Maps, Translate, etc. This app comes with the ability to provide automatic replies to the user when they are on the move. This saves a lot of time. 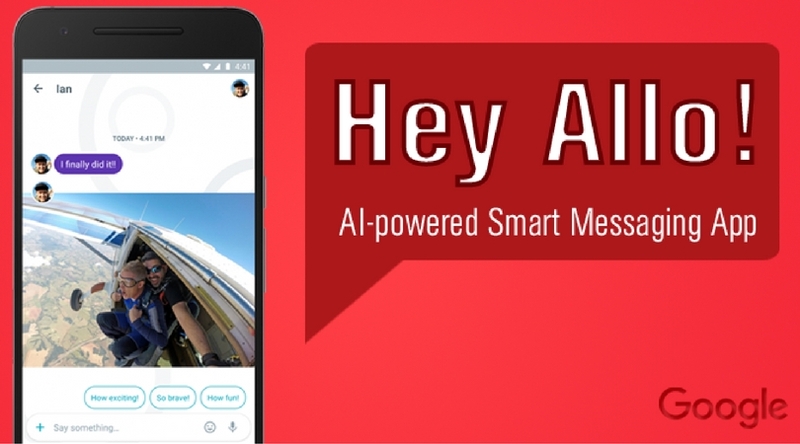 Even with suggested messages appearing bland, its software comes with machine learning which takes up all the characteristics of the user’s messaging habit as the user type in more information in this app. Allo also utilizes image recognition software from Google for providing Smart Reply which means that it can easily distinguish between a dog and a kid and provide suggest responses like “Wow, such a great baby”. Allo also comes with great features from its rival, iMessage from Apple and Facebook’s own Messenger like providing the ability to doodling on the pictures, send relatively larger messages along with sticker which are custom designed. Will it succeed in replacing the others? Allo is not the first attempt of Google with messaging app. It has tried to gain users who wish to be social rather than Hangouts, which is often used by office workers and runs via Google mail accounts. The most salient feature of this app is its smart assistant who can easily get information from the conversations. It has quite a lead on its other rivals when it comes to smarter messaging. As this app runs both on Android and iOS, along with contact numbers, it is more accessible than other rivals such as iMessage or Messenger. As Allo works on both iOS and Android, and with phone numbers it is arguably more accessible than either iMessage or Messenger. With this, we end our take on this great app launched by Google in this year. It is becoming quite a phenomenon when it comes to social users with people trying out and playing with a virtual assistant. There is the whole new world to discover with this wonderful app. In case you have tried this app and want to let us know your views and suggestions, then do mention them in the comment section below. Few Apps you don’t want to miss.